The least known of the sources of the Jordan River is the Nahr Bareighit (flea river) or Nahal Iyon (the name used in Israel). Like the Senir (Hasbani), this river begins in the Beka Valley of Lebanon. It is often overlooked when the sources of the Jordan are named. Nelson Glueck, The River Jordan, describes the Nahr Bareighit. 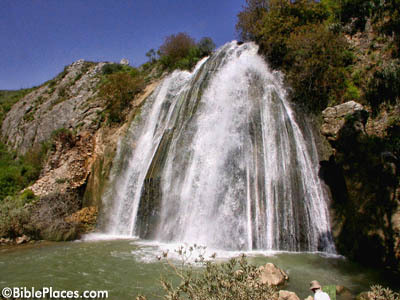 The westernmost source of the Jordan is the small mountain stream, Nahr Bareighit. Through a rude gorge, it tumbles down southward from the hilly meadowland of Merj ‘Ayun, which retains in clear part its ancient Biblical name of Ijon (1 Kings 15:20), to add its waters to the formation of the fateful [Jordan] river. The Nahr Bareighit joins the Nahr Hasbani about three quarters of a mile above the point where the Hasbani joins the junction of the Leddan and Banias streams. These last two alone were anciently considered as the sole sources of the Jordan. All found help to form it, and lose their identity in it, as the Jordan starts it flow under its own name. Deni Baly, The Geography of the Bible, devotes a single sentence to this little stream. The photo below shows the Iyon Mill Falls. It is one of the beautiful photos of several falls on the river from the Pictorial Library of Bible Lands. Check BiblePlaces.com to purchase the complete set or the DVD of Galilee and the North. Nahal Iyon Mill Falls. Photo courtesy of BiblePlaces.com. This entry was posted in Bible Places, Bible Study, Israel, Old Testament, Photography, Travel and tagged Jordan River, Lebanon. Bookmark the permalink.